Quinn Roberts is a sixteen-year-old smart aleck and Hollywood hopeful whose only worry used to be writing convincing dialogue for the movies he made with his sister Annabeth. Of course, that was all before—before Quinn stopped going to school, before his mom started sleeping on the sofa…and before Annabeth was killed in a car accident. Enter Geoff, Quinn’s best friend who insists it’s time that Quinn came out—at least from hibernation. One haircut later, Geoff drags Quinn to his first college party, where instead of nursing his pain, he meets a guy—a hot one—and falls hard. What follows is an upside-down week in which Quinn begins imagining his future as a screenplay that might actually have a happily-ever-after ending—if, that is, he can finally step back into the starring role of his own life story. This was a book that I purchased when it had recently came out but just like a lot of books, I own, it ended up on this never ending pile of books I kept promising myself I would get to. However, I kept pushing and pushing it back. Flash forward two years later and I am finally buckling down and knocking this book off as a book that I will have read this year. I had found the plot intriguing and that must have been the main reason as to why I must have bought the book (as so many others) However, as I started to read the book took a different route than what I was expecting. Author Federle give us readers a character who in his own way still discovering who he is in this world. A character who has confidence but has found reason to unleash it. A character who is struggling to keep his family together. Although, sometimes all it takes is just one person to change that all around and turn your world upside down. I am not sure where I am fully at with this novels component on mourning but it was interesting to see how it was portrayed in the novel. I don't think I have read a novel where it is the supporting character who struggles most with this compared to that of the main character but on the other hand it complemented the development of the story and some of the actions of the character as a whole. I think this was a risk on the authors part but was well thought out and executed to make this sub plot have originality. As for the romance aspect of the novel, I am kind of torn but as I reflected more on this, how are relationships not like this now a days. I always wonder, especially growing up if there is always that one person who is the person responsible for our firsts. I know there was for me but I am not everyone. 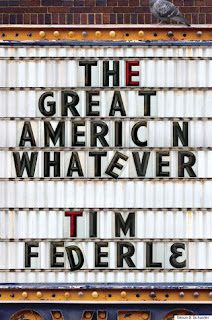 Tim Federle writes a novel is raw, smart, and relative to the lives of teens in our world today. Even though I am just now reading this novel, does not think that I wish there was a novel that showed me both the good sides and bad sides to growing up. 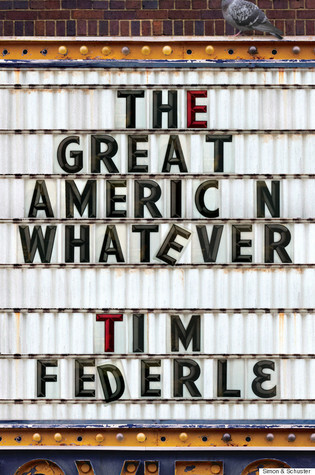 Filled with moments of love, sadness, The Great American Whatever is a book that brings a new twist to the YA contemporary genre.